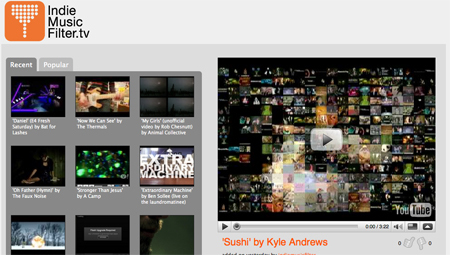 Whoa, just noticed I haven’t mentioned any of the new videos I’ve been throwing over to IndieMusicFilter.tv in a long time! Well, here’s some of the great vids we’ve dug recently. Oh, and don’t forget this one. Who Do We Care For by Sebastien Grainger. A very cool unofficial video for AC’s ‘My Girls’. ‘Bruises’ by Chairlift (Athens Soundies). ‘Lessons’ by Matt and Kim. ‘The Reeling’ by Passion Pit. Speaking of videos, check Wildbirds & Peacedrums Bandstand Busking.